CLEARANCE: Only 1 left. Open Box item. This sale is final; no cancellations or returns. Free shipping in contiguous U.S. 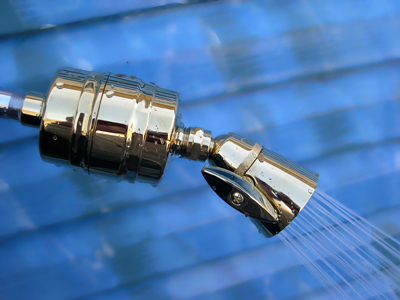 The April Shower™ Supreme filter's elegant all metal design combines aesthetic value with functionality. The Supreme Filter uses State-of-the-Art Filtration Technology to remove harmful chemicals and vapors from your shower. Feel the difference in your skin and hair by showering with the April Shower Supreme Filter. Did you know that you absorb more chlorine from your shower than from your drinking water? Say goodbye to chlorine in your shower with the April Shower Supreme metallic filter. The April shower filters purify your water, rejuvenate your skin, restore your hair's natural shine and invigorate your lungs. April Shower™ filters utilize kdf technology as the filtration media. Kdf is a compound of granulated copper and zinc that removes chlorine, iron oxides, hydrogen sulfide, and traces of heavy metals. It is a bacteriostatic media that inhibits the growth of e.coli, mold, and other bacteria. Kdf in the presence of hot water literally becomes catalyzed to perform more efficiently, therefore is the most efficient, state-of-the-art technology for shower and bath filtration.